Enhance Your Home and Garden by this Graceful Large Buddha Statue Symbol of Peace and Harmony. This is a beautifully crafted product which compliments your Home D cor. Size- 9 inches Length , Brass Metal , Weight- Heavy 1.2 KG (approx) , Made in India. 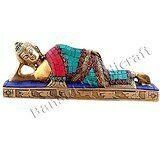 Buddha is in resting and reclining position and made of Solid Brass - very unique quality of Buddha. -------------- Pls beware from Copy product & ensure buying authentic product. This is exclusive product of Brand " Collectible India" and "covered by intellectual property rights laws". 'Collectible India' do not authorize any other Brand/Seller to sell it and won't be responsible if any copy or substandard product send by any other seller.